Warren Spector totally denies that "Mean Mickey" was removed from Epic Mickey due to focus group results. Warren Spector wants to set the record straight on how he made recent design decisions for Disney Epic Mickey. Earlier this year it was reported that the "Scrapper/Mean" version of Mickey the player would evolve into after making devilish decisions was cut out of the game due to focus group disapproval. Spector is now saying that this was a total fabrication. The Junction Point Studios head told 1up clearly: "Let me start by saying, I have never, and I will never, make a design change as a result of a focus test. It has not happened at any point in my 27 years, and it will not happen. I will quit if that happens -- if you ever catch me doing that, that will be last thing I ever do in the games business, okay?" Instead, Spector says that Junction Point created "over a thousand" versions of Mickey when the conceptual process began for Epic Mickey, and conducted a focus group showing them off back then. The general consensus was: "Don't mess with Mickey." Spector explains: "So three years ago, I said, 'Alright, that's too radical; we're not going to go that far with Mickey.' And I think I mentioned that at E3, and someone assumed that that happened this past Christmas. And so, 'Warren Spector got rid of the Scrapper because of a focus test!' And it's not true. The idea of the Scrapper Mickey went away because I didn't like it. There was no focus test. If there were any focus tests done last fall, no one ever told me they were happening or gave me any data about it." 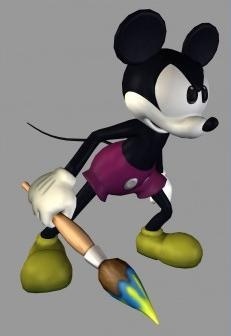 He says that Scrapper Mickey was only in the game due to a design decision that would change Mickey's abilities based on different costumes, which was cut, but Scrapper stuck around to show people the impact of the player's decisions on Mickey. A game director came up with the "guardian" system to use instead, and Spector liked that better. The original story of Junction Point designing Epic Mickey by focus group appears to be a mistake or misunderstanding. All that anger over focus groups destroying everything good in the world was simply wasted energy, in this case.